"Sha'ban is my month, Rajab is Allah's month and Ramadan is the month of my Ummah[Community]. Sha'ban is expiator,while Ramadan is the prufier." 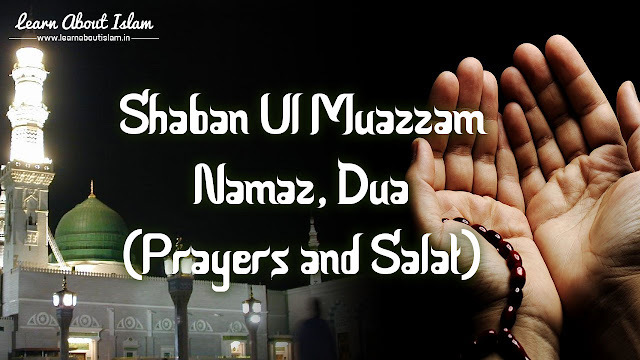 1) On first night of Shabaan, after Isha Namaz, Recite 12 Rakaat (6x2). In every rakaat, After Sureh Fathiha, Recite Sureh Ikhlas 15 times. i) Recite 8 Rakaat (4x2). In every rakaat, After Sureh Fatiha, Recite Sureh Ikhlas 11 times. ii) Recite 4 Rakaat (4x1). In every rakaat, After Sureh Fatiha, Recite Sureh Ikhlas 3 times. iii) On the first Jumma of Shabaan, After Magrib and before Isha, Recite 2 Rakaat Nafl Namaz. In every rakat, After Sureh Fatiha, Recite Aytal Kursi (10 times), Sureh Ikhlas (1 time) and Sureh naas (1 time). 1) On 14th Shabaan, After Magrib Namaz, Recite 2 rakaat Nafl. In every rakaat, After Sureh Fatiha, Recite Sureh Hashr, Last 3 ayat (1 time) and Sureh Ikhlas 3 times. Some people have misunderstood the reality of the Me'raaj of Sayyiduna Rasoolullah (Peace Be Upon Him) due to their lack of knowledge and research. Their ignorance in this field caused more confusion in their hearts because they failed to understand the unique relation between ALLAH and His Beloved Habeeb (Peace Be Upon Him). How true is the comment of Sayyidul-Maka'shifeen Sheikh-e-Akbar Muhiyyudeen ibne Arabi (Radi ALLAH Anh) who said that Me'raaj is a secret in a secret. One has to have sound knowledge of the Qudrat of ALLAH and the Station and Status of His August Rasool (Peace Be Upon Him) before commenting on any matter pertaining to them. Due to the lack of this knowledge some people have wrongfully said that Sayyiduna Rasoolullah (Peace Be Upon Him) did not see ALLAH with his naked eye and also did not proceed to the Divine Arsh on the night of Me'raaj. They say that both these things are impossible for any human being to achieve. Indeed the illustrious Ulama and distinguished Imams of Islam have in their authentic books expressed in great details on this subject. All these are based on the Ahadith Shareef. The narrators and presenters are all trustworthy Scholars of Deen. This matter is not something that entertains ones personal opinion. It depends solely on the authenticity of solid proof. Hence, confirmation deplores contradiction. Ignorance does not necessarily reject its reality. If one rejects it, one is in fact a liar and a contradictor of the Deen. Here is proof from QUR'AN, Ahadith-e-Nabawi (Sallallaho Alaihi Wasallam), Sayings of Sahab-e-Kiram and from the writings of great and authentic scholars of Islam that the Messenger of Allah Sallallahu Alaihi Wa Aalihi Wa Sallam did see ALLAH with his naked eyes and he also did proceed to the Divine Arsh on the night of Me'raaj. Imamul Mufasireen Ash-Shiekh Tibri reported in his commentary "Jami'ul Bayan", "Meraaj was done with both body and soul. If a person says that it was only soul who did the Meraaj or it was only a dream then this will be an insignificant charge. 1. If it so then what would be the evidence of prophet hood in it? 2. How one can name it as a miracle of Prophet (Peace Be Upon Him)? 3. Why the Mushrikeen-e-Makkah refuse to accept it because everything is possible in dream? 4. They actually argue on the possibility of doing a journey of months in little part of night. Sayyiduna Rasoolullah(Peace Be Upon Him) said, "I saw my Sublime Creator". Imam Jalaludeen Suyuti (Radi ALLAH Anh) in his Khasa'ise Kubra and Allama Abdur Raouf Munadi(Radi ALLAH Anh) in his Tafseer Shar'ha Jameh Sagheer state that this Hadith Shareef is authentic. "Verily, Sayyiduna Muhammad (Peace Be Upon Him) saw his Most Gracious Creator". Imam Ahmad Qastalaani (Radi ALLAH Anh) and Imam Abdul Baaqi Zarqaani (Radi ALLAH Anh) state that the authenticity of this Hadith Shareef is very strong. Sayyiduna Rasoolullah (Peace Be Upon Him) said, "Then a green Rafraf (Divine Carrier) was laid for me. Its light was even greater than that of the sun. Its brilliance brightened my vision. I was seated on it and taken into the Heavens until I reached the Arsh of ALLAH. It was the exclusivity of Sayyiduna Rasoolullah (Peace Be Upon Him) that he saw Almighty ALLAH with his physical eyes in wakefulness and this is the preferable Madhab. ALLAH Spoke to His Beloved (Peace Be Upon Him) in those high Divine regions which was above all possibilities and imaginations. Imam Ibne Asakar narrates from Sayyiduna Anas ibne Maalik that the Prophet of Allah (Peace Be Upon Him) said, "On the night of Isra my Lord, drew me so close to Him that we were two bows apart, in fact, even closer". There was a difference in opinion amongst the Ulama whether there was one Meh'raaj or two, one with the body and soul in wakefulness, and the other in a dream or wakefulness from Musjid-e-Haraam to Musjid-e-Aqsa. Then, from Aqsa in a dream till the Arsh. The truth is that there was one Isra and an entire journey from Musjid-e-Haraam to the Arsh was physical and in wakefulness. This is the Madhab of the majority of Ulama, Muhaditheen, Fuqaha and Mutakallimeen. 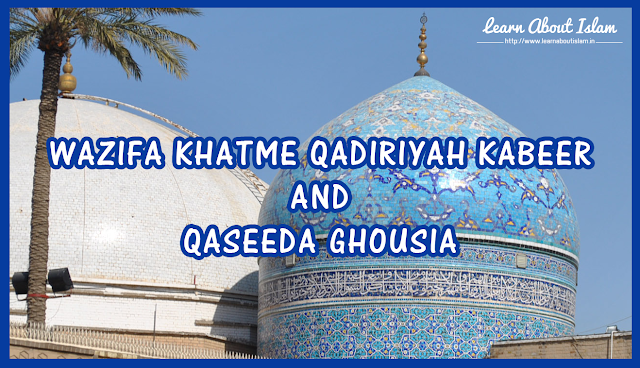 One can recite Khatme Qadiriya 11 times or 111 times alone or in group of Majlis. Qul Huwallahu Ahad. Allahuhus Samad. Lam Yalid. Walam Yulad. Walam Yakullahu Kufuwan Ahad. (111 Times). O Allah’s Beloved, Kindly Assist Me, There Is No Support For My Weakness But You. Hadrat Shaikh Muhay’yid’din, The Remover Of Difficulties, The Possessor Of Good. O Hadrat Ghaus, Help Us With The Permission Of Allah. Help For The Sake Of Allah, You Are The Light Of The Prophet. With The Wasila And Medium Of Hadrat Dastageer, May My Enemies Disappear. Mai Jis Jagah Kam Karta Hu Waha Kai Ladkiya Bhi Kam Karti hai Aur Kam k Silsile Me Mujhe Unse Bat Karna Jaruri hai Jab Mai Kisi Ladki Se Baat Karta hu To Us Waqt Peshab Ki Jagah Se Kuch Katre Kharij Ho Jata Hai kya Aisi Surat ke Mujhpar Gusl Wajib Hoga Kya Mai Gusl Kiye Bagair Namaz Padh Sakta hu.